English & French Carriage clocks for sale, with travelling cases, gorge cases. 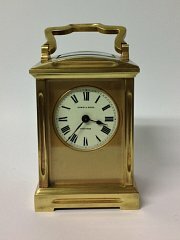 Original platform escapement clocks, miniature carriage clocks. All clocks have been fully overhauled and serviced and come with a one year warranty.